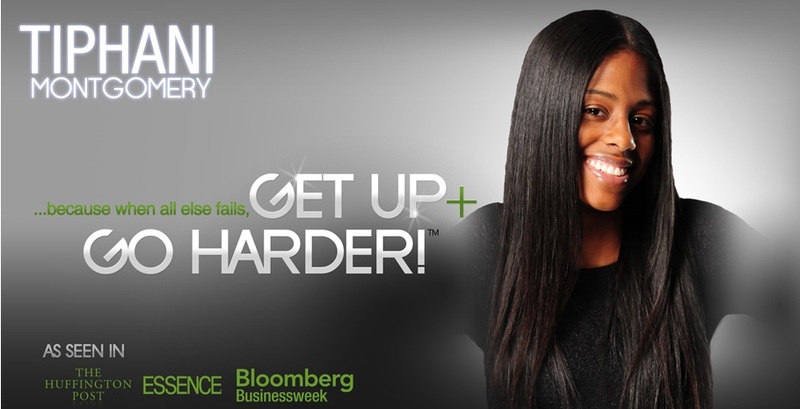 We became aware of Tiphani Montgomery whilst following Bloomberg Business Week. Tiphani is a best-selling author from North Carolina and the aim of her organization is to teach financial literacy and entrepreneurship to single mothers. Tiphani captivated us and we knew we would have to share with you how Tiphani turned her life around after being told she could not cope with being a young teenage mum and that her life was ‘over’. When I was 12, they told me I was stupid — and prescribed ‘smart pills’ (aka, Ritalin) to wrestle my brain into a state of submission. I fed them to my Rottweiler. They worked like a charm. When I was 21, they told me I’d never amount to anything — so I took my baby daughter, moved to a new state, self-published a book of poetry, and sold 2,500 copies in less than a month…from behind the bar where I mixed drinks & hustled tips. When I was 25, my college GPA was an abysmal 0.0 — so I dropped out. Wrote my first (of four) novels in two and a half months. And landed on the Essence magazine bestseller list seven separate times — including the #1 spot. At 26, I snapped open my eyes and saw the life I’d designed, with unflinching clarity. My love life was sick — with an infection that was poisoning my sanity, my creativity, and my ability to earn money — and hold my own power. I had allowed a series of bad relationships to spin me — a confident, self-made woman — into a docile doormat. And when I decided to GET UP + GO HARDER, my life transformed with incredible speed. That’s the power of taking responsibility for moments of ‘temporary insanity’, setting diamond-sharp goals, and holding yourself accountable for positive ACTION. Today, I’m no longer a doormat. And nobody calls me “stupid” — and I live to tell the tale. I’m a professional Challenger, and a master of manifestation. I’m synthesizing everything I’ve studied, experienced, and created in the realms of personal development, entrepreneurship & single parenting into my GET UP & GO HARDER empire. From 1-on-1 coaching & live onstage workshops, to my 21-day Challenge + weekly affirmations, everything I’m serving up on this site is designed to help you BELIEVE in your intuitive genius, TRUST your pro-active decisions, and LIVE your life as if you’ve already arrived, precisely where you want to be. My message is wild. It’s spiritual. And let me tell you — it is ABSOLUTELY about cashflow, power & fearless self-promotion. If your career is stagnating — or hasn’t even begun…If you’re locked in a déjà vu cycle of sickly relationships…If you want to be a role model for your kids — and bring out their gifts, by shining a light on your own…GET UP + GO HARDER is your new mantra, your new life-policy, and your new online bootcamp for coaching, accountability, self-respect, and success. HARDER than you ever thought possible.